There is an astonishing degree of similarity between Advaita Vedanta and Valentinian Monism. Most people don't know that there are 33 Aeons(Gnosticism) in Christianity as well as in Hinduism. "It is worth noting that Valentinianism shows an astonishing degree of similarity to another monistic system, the Advaita Vedanta school of Indian philosophy. In Advaita, the material world is an illusion (maya) attributed to ignorance (avidya) of the true reality. Through knowledge (jnana) of the ultimate reality (brahman), the world of multiplicity vanishes. True redemption (moksha) is the knowledge of one's true nature. This raises the intriguing possibility of some kind of connection between the two. There was some awareness of Indian thought in the ancient Roman world. However, at the time of Valentinus, there was no systematic statement of Advaita thought. It is possible that Valentinus came into contact with some form of early Advaita Vedanta teaching. 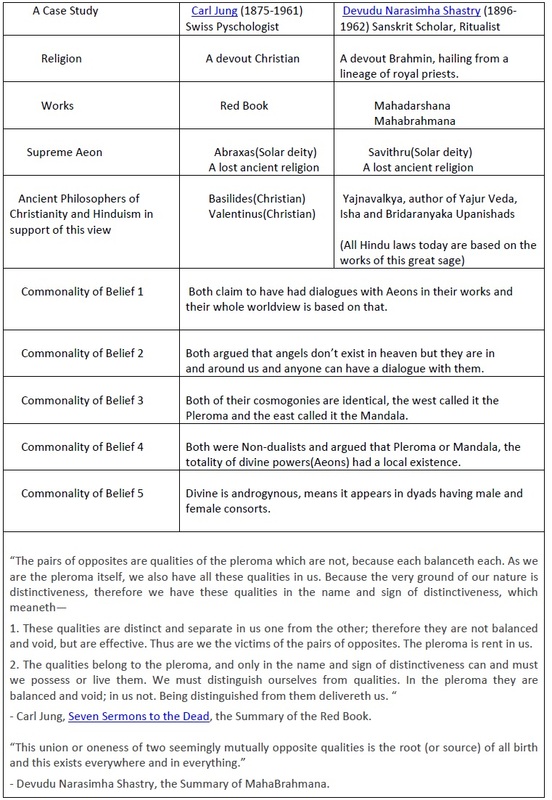 Advaita philosophy as it now stands was given its definitive form by Shankara in the 6th or 7th century AD. There also exists the possibility that he was influenced by Valentinian thought. Valentinians are known to have been active in the Middle East as late as the seventh century. It is possible that Valentinian missionaries or refugees may have made their way to India and come into contact with Shankara or his immediate predecessors. However, any connection between the two remains purely hypothetical." Since many look for a simple tool to create wave functions and want to run simulations on those wave functions without having to learn about all those programming languages and their implementation details which is a common issue with physics students who lack programming knowledge I wanted to introduce to everyone a simple QMTools Applet Editor where you can easily write your wave equations and simulate them and embed that applet code in any of your web pages. QMTools editor is an additional supplement which you get when you buy the Physics Text book, Modern Physics, 3rd edition by Serway, Moses and Moyer in which they have used it as a tutorial for their exercise problems. It was developed by Dr Curt Moyer and Mr Philip Brady and you can download this applet editor and other example files from this website QMTools Home. It requires a Java Run Time environment to be installed in your computer for the application to run and you can download the JRE tool form that website itself, the help documentation section in the QMTools editor is a must read in order to understand how to interpret, create and edit the wave-functions and also to understand on how to use the editor. The below applet application shows a simple example of how the equations are plotted as a function and simulated over time. You don’t need to learn any programming languages to do this just follow the instructions in the help section and start creating your own wave-functions.